Post-translational modifications of histones play a large role in helping a cell to function properly, such as repairing damaged DNA. However, it is difficult to pick apart the structural alteration of histones induced by individual modifications. By using synchrotron radiation circular dichroism spectroscopy, Yudai Izumi and his group at the Hiroshima Synchrotron Radiation Center became the first to observe what happens to the structure of H3, a type of histone protein, when it undergoes a special type of post-translational modification called K9 methylation. In this instance, K9 dimethylation of H3 must happen so that BRCA1, a protein associated with a higher risk of breast cancer when mutated, can help repair damaged DNA. The results of this study, which were published online in the Journal of Radiation Research in December 2017, contribute toward greater understanding of how DNA damage repair works. 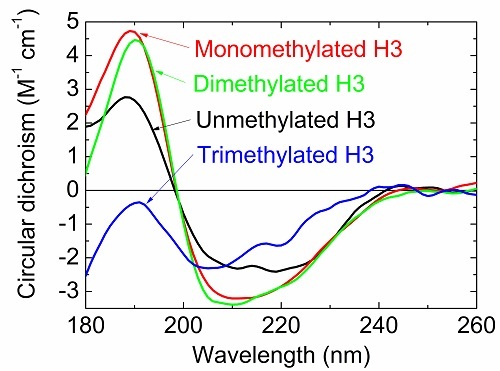 Circular dichroism spectra of unmethylated and methylated H3 proteins. Schematic view of the proposed structures of unmethylated and methylated H3 proteins.